EPSOM, England - June 11, 2015: The new Toyota Avensis aims to make things easy for the customer, with new style, new engines and innovative technology. Regardless of version or equipment grade, it is designed to be prestigious and trustworthy. Designed and engineered in Europe and built exclusively in Britain, more than 1,711,800 Avensis across four model generations have appeared on European roads since the original was launched at the end of 1997. Quality durability and reliability have always been among Avensis’s strongest suits, reflected in the current model achieving consistently high QDR ratings and the highest score in last year’s J.D. Power Vehicle Ownership Satisfaction Survey in Germany. Although Avensis has traditionally appealed to private customers, it’s the fleet market that easily commands the largest proportion of sales, accounting for 75 per cent of D-segment business in Europe. • Styling: a new, more prestigious and dynamic exterior design with LED lamp technology. • Sensory quality and comfort: an all-new, more elegant and refined interior, with an emphasis on significantly improved sensory quality, comfort, trim, finishes and NVH. • Safety: a comprehensive upgrade of safety systems, targeting a five-star Euro NCAP rating. A focus on active safety technology introduces the new Toyota Safety Sense package, provided as standard. • Equipment and value for money: a new, more clearly differentiated grade structure with class-leading standard equipment levels and advanced technologies, such as the Toyota Touch 2 system and an eight-inch multimedia touchscreen. • Driving pleasure and running costs: two new Euro 6 diesel engines with extended service intervals, lower CO2 emissions across the entire range, lower servicing costs and chassis enhancements to improve ride and handling. Toyota anticipates that these improvements will not only promote greater loyalty within the model’s existing customer base, but will also increase Avensis’s appeal to new customers as a genuinely attractive proposition. Jon Corpe from Toyota Manufacturing UK’s Burnaston plant, speaking two weeks ahead of the start of production, talks about how the factory prepared for the simultaneous introduction of new Avensis and new Auris. The simultaneous start of production of two new models – Avensis and Auris – is a first for TMUK. We don’t have a dedicated Avensis line; the car is built alongside Auris on the same production line, including weld shop, paint shop and so on. Normally, as production of an outgoing model slows, the new model takes over on the line to compensate, so the number of cars leaving the plant remains fairly constant. In this case, however, production of both models comes to an end at the same time, then both new models start. This simultaneous start of production means we have to ramp up from zero to 800 vehicles a day over a period of just 10 days. Achieving this presents two major challenges. The first is to set up the plant and the second is to meet the global demand for the new vehicles. Both models are going to market immediately, so we have to do this in a very short period of time. Even during production start-up we will be building up to 280 new Avensis a day. The two new models mean we need to carry out a significant update across the entire plant. Press, weld and paint shops have new tooling and jigs to support body manufacture and painting, and the substantial number of improvements to the vehicle, in areas such as safety and handling, require additional parts and processes. But the greatest level of change is in the plastics and assembly shops. In plastics, most of the processes have been affected by the introduction of the new vehicles, calling for new moulds and great deal of new tooling and equipment. In the assembly shop, more than half the processes are new, and the introduction of Euro 6 emissions standards has meant an update for our entire engine range for both models, plus, of course, the addition of three brand new engines. The new engines and the introduction of Toyota Safety Sense add a significant new dimension to the checks made in quality assurance. For instance, we have had to install new road markings and signage on our test track to confirm the real-world functionality of the new lane-keeping, sign recognition and pre-crash systems. This means our workforce – TMUK has more than 2,000 people operating on a rotating day and night shifts – has had to train to build two different models at once. Nothing remains the same. The Standardised Work, the foundation of our production method, has had to be rewritten. The specialist equipment has had to change and the number of parts we have to manage has doubled. It’s a big challenge. Each member must be equally skilled in building every variant of both models. Because the cars are built to customer order, they don’t come down the production line in batches, it’s just one line with a huge variation in product. Each process in the plant has what we call a Takt time. The Takt time we’re currently working to means that a car will drive off the production line every 66 seconds, and everyone’s process, wherever they are working in the plant, is designed around that 66-second timeframe.. This means we have had to redesign every process so that its work content can be accomplished in 66 seconds, then, before the start of production, train every member so that they can complete their process on time, every time, without error. It’s a huge task. Obviously we have to manage to lots of equipment as well, including any new tooling. And, with two vehicles changing, the number of parts we have to change doubles. A supplier’s work can double too, if they are supplying parts for both models. TMUK has been involved in the new Avensis programme from the very early stages, influencing the design to ensure the quality of the finished product. We call that first phase “design and development”. Working alongside design and R&D, we study new designs and even build a digital car using CAD to make sure the new vehicle can be built and quality assured. Then we are involved in the confirmation assembly build of the very first vehicles to make sure quality can be built-in. We assemble a number of vehicles with the designers present and study the build process as we go. It’s quite a long, intensive process, during which we’re also writing and fine-tuning our standardised documentation on how to build the car. During this phase we look at the vehicle from four different perspectives. We’ll study each part – for Avensis alone the list numbers around 3,000 – make sure our tools and equipment are suitable, make sure the members can build it, and make sure the build method is correct. Because of our early involvement in the programme, we perfected many aspects of the assembly – the body build, the robot teaching and so on – early last year. Nonetheless, we still have a great deal to do. The plant will be empty for only a very short time – just a weekend – during which we’ll complete a very quick changeover of all the equipment we weren’t able to change during preparation, re-stock with new parts and begin the ramping up process. Then we will have just 10 days to accelerate our production from precisely zero to 800 cars a day. Both the new Avensis saloon and Touring Sports wagon have a more distinctive and dynamic appearance, generated by a new Energetic Elegance design theme. Overall vehicle length has been increased by 40mm and at the front there is a strong new look that marks a “second generation” evolution of Toyota’s contemporary design language. The Toyota emblem is set more prominently within a smaller but sharper-styled upper grille. The grille itself has a chrome trim bar which anchors new LED headlamp clusters. These incorporate LED daytime running lights, giving new Avensis an individual illumination signature. The lower grille has been made significantly larger and it spans a centre bumper section finished in gloss black, reinforcing Avensis’s solid front stance. In conjunction with the downward sweep of the new grille, the fog lamp housings have been pushed out to the far edges of the bumper, making the vehicle appear broader. To the side, a new garnish along the sill creates a strong horizontal emphasis, giving the impression of a lower centre of gravity. The more elegant profile is supported by new alloy wheel designs. The rear of the vehicle has also been designed to add elegance and impact to the broad road stance. The rear light clusters use LED light guide technology to generate a high-tech lighting signature. European product planning’s role is to ensure the smooth translation of market requirements into the work of our engineers and designers. By leading the Avensis project in Europe, with European development and design, we can make sure the expectations of European customers are met. This is especially the case for fleet customers. This is very important to this project, because fleet business represents 75 per cent of segment sales. Today, the decline in the D-segment is mostly due to falling private sales; fleet sales remain strong, so overall this remains an important part of the European market. We research fleet company car drivers – the user-choosers – intensively. We identified all their key requirements to ensure nothing is missing when they come to select their next company car. Those requirements are a strong interior and exterior style, value for money, sensory quality and equipment. But before that, it is the fleet manager who decides whether a car is added to the vehicle list in the first place. And for them, total cost of ownership is important. That means low CO2, low fuel consumption, high residual value, long service intervals and, of course, high levels of quality, durability and reliability. Our research also tells us that safety is a key concern for fleet managers. This means we must offer a car with a five-star Euro NCAP rating and the very latest in active safety equipment. This why the new Toyota Safety Sense system is standard on new Avensis. Avensis is a key product in Toyota’s fleet strategy, because it lets us provide fleet customers with a one-stop shop solution. Fleet managers like to find a single supplier that can offer a comprehensive product range, including both passenger cars and commercial vehicles. Having an offer in the D-segment is fundamental to that approach. But there are other reasons for our investment in new Avensis: we consider this car to be the Toyota brand flagship. It’s not only an aspirational product for both existing and potential Toyota customers, it is also a key profit contributor to the Toyota network in Europe, particularly in regions such as Scandinavia. On the other hand, Avensis is a strong contributor to the brand in areas such as prestige. It is a sign of the very strong customer loyalty it generates that in households where there is an Avensis, we find there’s a high probability that the second car in the family will also be a Toyota. So, in broad terms, Avensis customers are looking for more luxury, more comfort and more high-tech equipment. But we have to distinguish between the private and fleet customers. Private customers are looking for a certain type of styling, which we’ve identified through our research as including elements of prestige, elegance and luxury. They are also looking for value for money. The fleet customers, who are on average younger and much less brand-loyal, have different expectations when it comes to styling. They, too, want value for money, with a focus on high equipment levels. So the design we produced for Avensis offers a good balance between sportiness and elegance, as required by the differing tastes of the private and fleet markets. The new Toyota family face is important to ensure consistency with our other vehicles, but we also wanted Avensis to stand out, immediately noticeable as our flagship. Knowing that fleet customers often also have premium brands on their shopping list, we targeted new levels of sensory quality to create what we call a “one grade up” feeling. We achieved this through perfect consistency of colour, materials, character lines and backlighting. We use highly tactile materials for the door and instrument panels, adding a new level of richness to the touch. We have also introduced Alcantara to the seat upholstery as standard from mid-grade (Business Edition). In all, these measures help us achieve an interior which we feel offers one of the best perceived values in the class. Equipment levels are also very important for European customers. We have best-in-class safety through the standard provision of Toyota Safety Sense, and in terms of HMI there is the eight-inch Toyota Touch 2 screen and 4.2-inch colour TFT multi-information display – both standard from Business Edition grade. The final element is dynamic improvement, where we focused on what we know is important for fleet customers, who spend long hours at the wheel. We have concentrated on seat comfort – both overall comfort and holding performance – and on NVH improvements. From a powertrain perspective, fleet business in the D-segment is almost exclusively diesel and this is why it was so important to update our offer; new 1.6 and 2.0-litre units which we know are positioned in the core of the segment and are very competitive in terms of the relationship between CO2 emissions and performance. Where the new 1.6 D-4D engine is concerned, CO2 is down by 11g/km and for the 2.0 D-4D it’s 24g/km, compared to the previous generation. Those are significant improvements, not just fine tuning. With the 1.6 diesel we’re entering the small engine sub-segment with Avensis, an area that is growing very rapidly due to CO2-based taxation schemes. Again, this is something very important for fleet. However, despite following this trend for downsizing, the 1.6 D-4D is not an entry, eco-version. Out engineers have been able to maintain the high driveability and comfort expected of a D-segment model. In some markets, private sales are more biased towards petrol. For Avensis we have kept our existing petrol engines, but significantly improved fuel efficiency and the CVT transmission, in terms of fuel efficiency and driveability, particularly in city traffic. 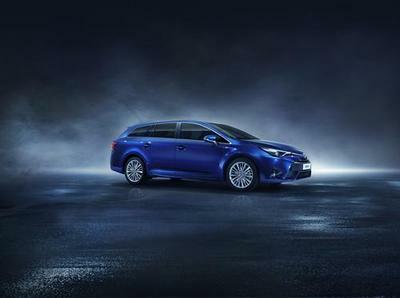 One of Toyota’s aims in creating the new Avensis was to guarantee comfort and convenience across the range. The elegant, refined interior makes an important contribution to this goal: sensory quality and NVH have been taken to a higher level and there are new, premium quality trim finishes. The instrument panel is divided into two sections. The sleek, full-width upper part contains an instrument binnacle with recessed tachometer and speedometer dials either side of a large, 4.2-inch TFT multi-information display (colour display on higher grades, monochrome on Active grade). The lower section houses a centre console that is separated from the transmission tunnel and dominated by an eight-inch full colour touchscreen. A redesigned steering wheel and gear lever complete the driver’s cockpit. Switchgear feel and operation have been improved and sensory quality has been further heightened by harmonising graphics and symbols and providing uniform, blue back-lighting. Satin chrome highlighting on the instrument binnacle, steering wheel, console switchgear, air vents and gear lever presents a crisper, higher quality appearance. A new range of more appealing interior finishes is available, including combinations of fabric or leather with Alcantara seat upholstery (a first for the Avensis’s class) and a new, Dual Ambient light grey colour scheme. The cabin is further improved with the introduction of a new front seat design, making for more comfortable long-distance travel – a priority for fleet/business customers. The size of the upper backrest has been increased and the backrest bolsters have been redesigned, giving both extra shoulder support and better lateral holding performance. The seat suspension mat has also been redesigned to improve pressure distribution and reduce long-haul fatigue. The cushion angle has been increased to give better thigh support and the cushion side bolsters have been reshaped. NVH levels have been significantly reduced, ensuring that the increase in new Avensis’s interior quality is matched by a perceptible decrease in cabin noise. New and thicker materials provide additional sound absorption and insulation, and seal quantity, thickness and width have been increased throughout the body shell. The thickness and density of the bonnet insulator and the thickness and size of the of the engine under-cover insulator have been increased. Diesel models further benefit from the addition of an underbody damping sheet. A polyurethane foam over-moulding has been incorporated in the wing protector and further detailed changes have been made to sound-absorbing elements in the upper instrument panel and dashboard. Air conditioning noise has been reduced by improving the heater’s air duct seal. Touring Sports versions fitted with a Skyview panoramic roof gain a damping sheet in the roof lining. Avensis adopts a new grade structure which reflects how it has been designed, engineered and equipped to meet the leading requirements of both private and business customers. The established Active and Excel grades mark the entry point and top of the range. These are joined by new Business Edition and Business Edition Plus versions at the heart of the line-up. Across the board, specifications secure high levels of safety, comfort and convenience, not least with the standard provision of Toyota Safety Sense integrated active safety features on all models (further details in the Safety chapter below). Key features of the Active grade include Pre-Crash Safety system with Autonomous Emergency Braking, cruise control, air conditioning, six-speaker CD/radio audio, Bluetooth, auto-dimming rear-view mirror, LED rear and daytime running lights and power windows. Business Edition adds to this strong foundation with the Toyota Touch 2 with Go touchscreen multimedia and navigation system, digital/DAB audio package with eight-inch display, reversing camera, front fog lights, rain-sensing wipers, dusk-sensing headlights, automatic air conditioning, 17-inch alloy wheels and part-Alcantara seat upholstery. The active safety features extend to Automatic High Beam, Lane Departure Warning and Road Sign Assist. Business Edition Plus delivers further premium features including leather upholstery with Alcantara inserts, front fog lights with a cornering function, LED headlamps, smart entry and rear privacy glass. The LED daytime running lights gain light guides, creating a distinctive lighting signature. Customers can choose from 10 colours, with the metallic options including new Havana Brown and Orion Blue shades. Option packs are also available: the Protection Pack (£325) provides mud flaps, scuff plates, boot liner and rear bumper protector (plus additional load space rails for the Touring Sports if required); the Chrome Pack (£250), available for Avensis for the first time, adds chrome side sill and boot/tailgate trim; and the Parking Pack (£495) equips the car with front and rear parking sensors. Clear, instant driver information is displayed on a new 4.2-inch colour TFT screen, set between the principal meters in the instrument binnacle. The range of data includes audio, phone, navigation and safety functions, including active safety system status and warnings. The display’s design allows multiple information sources to be presented simultaneously. The TFT display is in colour on all new Avensis models apart from Active grade, which uses a monochrome version. All Avensis models are covered by Toyota’s five-year/100,000-mile new vehicle warranty. Revisions to front and rear suspension, improved steering feel and responsiveness. Toyota has comprehensively revised the powertrain line-up for new Avensis, building on its reputation for reliability and durability and providing customers with the benefits of lower fuel consumption, emissions and ownership costs. At the same time, enhancements to the body structure, suspension and power steering deliver improvements in ride comfort and handling performance. The UK range features two new diesels: a 1.6-litre D-4D and, making its first appearance in a Toyota, a 2.0-litre D-4D unit. The 1.6 D-4D generates CO2 emissions of just 108g/km, 11g/km less than the 2.0-litre unit it replaces. The new 2.0-litre engine’s 119g/km represents a 24g/km reduction on the performance of the outgoing 2.2-litre unit. An increase in service intervals to 12,500 miles and a reduction of about 20 per cent in the 36,000-mile/three-year servicing costs for both units have helped make the diesels cheaper to run. In tune with the current move to downsize powerplants to achieve better fuel economy, lower emissions and better driving dynamics, Toyota is replacing Avensis’s current 2.0-litre D-4D diesel engine with a new 1.6 D-4D. This Euro 6-compliant engine, working with a six-speed manual transmission, is 20kg lighter than its predecessor. It develops 110bhp/82kW at 4,000rpm and 270Nm of torque from 1,750 to 2,250rpm. This gives 0 – 62mph acceleration in 11.4 seconds and a top speed of 115mph. The engine posts an eight per cent improvement in fuel efficiency compared to the previous 2.0 D-4D, with combined cycle fuel consumption of 67.3mpg; at the same time, CO2 emissions have been reduced from 119 to 108g/km. The engine has been tuned for fast throttle response throughout the rev range. It generates good initial response at low rpm, then, as turbo boost develops, a linear build-up of torque. The availability of torque has been extended, so the engine will rev freely beyond 3,000rpm without running out of breath. The new Euro 6-compliant 2.0-litre D-4D shares the low fuel consumption and emissions performance of its 1.6-litre sister unit, but it has been tuned for a stronger focus on performance. It develops a maximum 141bhp/105kW at 4,000rpm and a generous 320Nm of torque from 1,750 to 2,500rpm. Its linear torque build-up and willingness to rev gives it particularly strong in-gear responsiveness and acceleration: it will move the car from rest to 62mph in 9.5 seconds and reach a top speed of 124mph. Numerous developments, including a new timing chain design, ensure quiet running at all speeds, and Toyota’s stop and start technology, coupled with a tall sixth gear for motorway cruising, helps the 2.0 D-4D return average fuel consumption of 62.8mpg with 119g/km CO2 emissions. Both the new diesel engines benefit from numerous advanced technologies that help minimise fuel consumption and emissions without detracting from engine performance and driving pleasure. A fuel injection control system uses Digital Diesel Electronics to control injection in line with engine speed, load and temperature to gain more precise control of pressure, timing and volume than can achieved with conventional common rail technology. This allows for better fuel efficiency and compliance with stricter emissions regulations to be achieved with no detriment to engine performance. A combination of swirl and tangential intake ports creates an ideal swirl pattern in the intake air/fuel mixture, promoting more complete combustion and, hence, greater engine efficiency. The camshaft has a built-up construction, comprising individual cams, gears and shaft. Each component is made from a carefully selected combination of materials. This design approach reduces overall weight by around 40 per cent, a saving that contributes to overall fuel efficiency. The Hydraulic Valve Clearance Compensation system features hydraulic pistons that continuously adjust individual intake and exhaust valve clearance according to engine speed and load. This optimises intake and exhaust airflow for better engine performance and fuel efficiency. A cross-flow cooling system channels engine coolant flow from the hotter exhaust side to the cooler intake side for more even heat distribution over the cylinder head. This reduces pressure losses and enhances fuel efficiency. Together with its sound-absorbing properties, the resin cylinder head cover allows – thanks to its ease of manufacture – for a more complex inner structure. This means the oil separator and pressure control valve have been built into the cover, to separate the oil from the blow-by gas. This reduces the amount of oil burned during re-combustion, reducing emission impurities. A new charging control system automatically regulates the amount of electricity generated by the alternator, which affects the amount of load on the engine, according to driving conditions. The system increases alternator load under deceleration and decreases it under acceleration, and can also balance fuel efficiency with the electricity needed when the engine is idling, or at cruising speed. Both engines are equipped with Toyota’s stop and start system and a high-performance diesel particulate filter, further reducing particulate and CO2 emissions. The four-cylinder, 1,798cc, 16-valve DOHC engine develops 145bhp/108kW at 6,400rpm and 180Nm of torque at 3,800rpm. Matched to a six-speed manual transmission, it will accelerate the Avensis from 0 – 62mph in 9.4 seconds (10.4 with CVT) and on to a 124mph top speed. Combined cycle fuel consumption has improved to 47.1mpg and CO2 emissions have fallen by 14g/km to 139g/km – band E for road tax/Vehicle Excise Duty (figures for saloon with 16-inch wheels). When matched to the Multidrive S CVT, the benchmark figures mark a similar improvement at 138g/km and 47.9mpg . The operating angle of the Valvematic and VVT-i systems has been increased to optimise valve lift angle and timing across the driving range. As a result, power output has been increased and mechanical losses reduced, thus improving fuel efficiency. Continuous optimal throttle control in accordance with Valvematic and VVT-i operation further improves both fuel efficiency and driveability, and the addition of an oil temperature sensor enhances VVT-i performance for a further gain in fuel economy. The compression ratio of the 1.8 Valvematic engine has been increased to 10.7:1, enhancing thermal efficiency, and the fuel system benefits from changes to fuel injection and timing, reducing fuel loss to the exhaust side under injection. Friction has been significantly reduced by fitting a tension-reducing ribbed V belt auto-tensioner and a low-friction timing chain and chain damper; the adoption of Teflon coatings to front and rear oil seals and resin coatings to the sliding surface of the crankshaft, camshaft and thrust bearing; and the reduction of both oil pump flow and vacuum pump drive torque. Engine warming performance has been improved by using a shell-type exhaust manifold and the optimisation of valve timing and fuel injection quantities. This accelerates the increase in exhaust gas temperature, warming the catalyst quickly to reduce emissions from cold starts. The cooling system has been improved through the installation of a high-response thermostat and precise electric fan control. These measures improve anti-knock performance and, hence, fuel efficiency. Compatibility with high sulphur fuels has been achieved through a nitride treatment on the positive crankcase ventilation valve and a height change to the piston rings. Finally, both units also benefit from the previously described Charging Control System. A further four per cent improvement in fuel economy has been realised through extensive revisions to the Multidrive S continuously variable transmission that is optionally available with the 1.8 engine. These include new torque converter, continuously variable unit, oil pump, reduction and differential gears, hydraulic control unit and CVT fluid warmer. The CVT control logic has also been adjusted to reduce engine revving at medium throttle settings, more closely matching engine speed to throttle inputs, like a conventional automatic transmission. The new Avensis’s bodyshell has been rendered more rigid by the application of additional spot-welding points and the use of a high-strength urethane windscreen bonding material. The car retains the proven MacPherson strut front and double wishbone rear suspension design of its predecessor, but both elements benefit from significant changes to improve ride comfort and handling. These include a change from resin to steel for the bearing material, reducing friction and so improving steering feel and feedback. At the front there is a new strut bearing and support, a reduction in the spring rate and an increase in the spring side-load compensation. Damping force has been tuned and, in the case of diesel models, the springs’ shape has been changed and their rates adjusted in favour of comfort. . Similar adjustments have been made to the rear, together with a new piston valve design that gives a perceptible improvement in ride comfort. Steering feel and responsiveness have been improved by the use of a new intermediate shaft, a change in the diameter of the anti-roll bar and an increase in body shell rigidity through the use of high-strength urethane bonding for the windscreen. Changes have also been made to the electric power steering’s assistance characteristics. The neutral position is more accurate for better high-speed straight line driving, and steering torque delivery has been fine-tuned to better match linearity with lateral acceleration and yaw response. Hill-start Assist Control adds further benefits. This applies brake pressure to all four wheels for a maximum two seconds when the driver comes off the brake pedal to apply the throttle. This prevents the vehicle from rolling backwards when pulling away on a steep or slippery incline. From the European R&D perspective, this was a milestone project. Avensis is a Europe-unique vehicle, built in Europe. We had a great deal of previous involvement with the model and knew that we could develop it further and perfect it, particularly in the context of fulfilling the requirements of fleet customers. Our management in Japan told us “you make the business case, you decide what you can do, and you will have to take on the majority of the workload from day one”. That means Toyota Motor Europe was involved in a number of activities where we had no previous experience. So, to adapt to that new position, we had to develop our organisation in parallel with the project itself. From a resource point of view, certain elements were not in place. For instance, this was the first time we worked with an external company to help us out on the engineering side. This was an important step for us, showcasing the fact we can have the flexibility to develop projects, even if we don’t have the resources there, ready from day one. So people joined and then left as the project progressed, helping us with electronics, body design, engineering and other key development areas. I started planning the project at the start of 2012, spending the first six months simply deciding what we wanted to achieve and how to get there. By August we had a scenario and a business case ready for the changes we wanted to make. If you look at the new model, you’ll see that a lot of the change content is of the type we usually only do for an all-new vehicle, such as a full interior and combi-meter development. These don’t fit in with our typical minor change schedules, so it was quite a challenge to work within the short timescale we had set ourselves. This is the first time we’ve carried out such a major content change in such a short time. We’re talking plant investment of 36 million euros (about £26 million), 368,000 man-hours and more than 1,000 vehicle part changes. A certain percentage of Avensis production is for what we call general export, and this vehicle is also imported into Japan. It very much appeals to Japanese customers as a “European-style” vehicle and they are prepared to pay a premium for certain specification that’s not available in their domestic market. The European-specification vehicle takes the lead in style, sensory quality, grade structure and safety; every other specification for other markets is a derivative of this. At the start of the project, we agreed on a number of focus items. We had the luxury of the vehicle already being in the market, so we could talk to our network of national importers, dealers and customers, and make a shortlist of the items we should focus on. We were asked for improved sensory quality and comfort, more dynamic styling, a more flexible equipment line-up – especially in the context of fleet – and, of course, safety. That last is a big one, because in order to tackle the fleet market, we had to ensure Avensis has a five-star Euro NCAP rating. This meant redeveloping the vehicle to meet the crash test programme’s 2015 requirements, which was quite a big challenge. The European Sensory Quality Division was involved in the planning from day one. Previously we were just making sure we had the same surface finish, colour quality and so on. On this project we looked in far greater depth, for instance at shape and symbol consistency. During the early styling reviews, the SQ team was already giving feedback on shapes and materials to ensure we didn’t use too many, or have any mismatches. The exterior styling was also a first for TME, because we changed the sheet metal and, in the cabin, we took responsibility for developing the new instrument panel. This is the first time we’ve tackled an interior at this level. Where equipment is concerned, one of our key aims was for better integration into the vehicle, as some customer feedback suggested it currently came across as lacking in overall co-ordination. So we have ensured the display/audio, combi-meter, heating/ventilation and other systems such the pre-crash all talk to each other and are fully integrated, not just a box-by-box installation. Previously, the engineers for each of these systems worked with different colours and symbols. Now we have designed a master to ensure all symbols, fonts and new blue illumination match on each element, from steering wheel to centre console and so on. Although everyone talks about the new diesel engines being supplied by BMW, I should point out that the combi-meter, the pre-crash system and quite a number of critical safety items were also sourced from European suppliers. Of course the new 1.6 D-4D engine was first installed in Verso, which was when we had to address all the main installation challenges. With Avensis we could focus more on driveability and comfort, especially from the perspective of fleet customers. BMW worked closely with us on our driving events to help fine-tune these aspects of performance. There were some heat management issues, but the bigger challenge was installing the 2.0-litre diesel unit in a Toyota for the first time. We were very focused on the engine’s driveability. We still wanted it to have the Toyota family feel, but for there also to be a clear differentiation between it and the 1.6, so people could clearly recognise the different merits of the two units. We developed the Avensis with the target of achieving a five-star rating from Euro NCAP. Because of the big changes in the organisation’s test criteria, this presented a significant engineering challenge, especially where pedestrian protection was concerned. For driving pleasure and comfort, we focused on NVH intrusion in the cabin and seat comfort. We redesigned the seat to ensure that fleet customers who spend a long time behind the wheel don’t become uncomfortable or tired when driving long distances. From the driving dynamics perspective, we have a new shock absorber supplier. That gave us new opportunities to tune damping in a different way, and we have specifically tuned the vehicle to best suit the European market. For instance, the rear end of a Toyota is traditionally tuned to be quite stable, because a feeling of stability is extremely important to Japanese customers. In Europe, customers are more concerned about a car’s agility and sharpened steering feel. So we have been able to shift the balance of the vehicle more towards the European dynamic style, while complementing this with a stiffening-up of the body shell. As ever, though, there is a difference between the requirements of private and fleet customers. The fleet customer spends much more time on the road, so favours a more dynamic driving style and long-haul comfort. For the private buyer, the emphasis on handling is not so high. Having a good-looking car and value for money are more important to them than the last word in driving dynamics. That being said, it isn’t efficient to focus on just one area of vehicle development. For Europe, the overall balance of Avensis is more important than any single aspect. If the customer gets behind the wheel, they shouldn’t be distracted by one very good thing, or one very bad thing. They will spend a lot of time in the car and simply want to feel completely at ease. Package on all models includes Pre-Collision System with Autonomous Emergency Braking. In anticipation of securing a five-star rating in the Euro NCAP crash test programme, new Avensis takes active safety and driver assistance to new levels with Toyota Safety Sense. On all models this provides a Pre-Collision System with Autonomous Emergency Braking. On all bar the entry-level Active grade the package further includes Lane Departure Alert, Automatic High Beam and Road Sign Assist, functions which process information gathered by a compact laser and camera unit mounted on the head of the windscreen. The Pre-Collision System operates at speeds between approximately six and 49mph, detecting vehicles on the road ahead and reducing the risk of a rear collision. When it determines an impact risk, it triggers visual and audible alerts to prompt the driver to apply the brakes. At the same time, it primes the car’s braking system to deliver extra stopping force when the driver presses the brake pedal. If the driver fails to react in time, the system automatically applies the brakes, reducing speed by about 19mph, or potentially bringing the car to a stop, to prevent a collision or mitigate the force of impact. The Lane Departure Alert system monitors lane markings on the road and helps prevent accidents and head-on collisions caused by a vehicle leaving its lane. If the vehicle starts to deviate from its lane without the turn indicators being used, the system alerts the driver with visual and audible warnings. The Automatic High Beam helps ensure excellent forward visibility when driving at night. It detects both the headlights of oncoming vehicles, and the tail lights of vehicles ahead, automatically switching between high and low beams to avoid dazzling other drivers. As high beam is used more frequently, pedestrians and obstacles are easier and quicker to spot. Road Sign Assist helps ensure drivers are kept informed, even if they have driven past a road sign without noticing. It recognises signage such as speed limits and “no overtaking” warnings, and displays the information on the TFT multi-information screen in the instrument binnacle. If the driver exceeds the speed limit, the system will activate a warning light and buzzer.